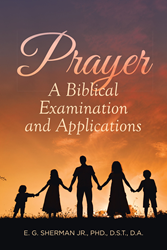 Recent release “Prayer: A Biblical Examination and Applications” from Page Publishing author E. G. Sherman Jr., PHD., D.S.T., D.A., is a scholarly account that discusses the aspect of prayer anchored in the Judeo-Christian viewpoint. E. G. Sherman Jr., PHD., D.S.T., D.A., a professor emeritus of sociology, history, philosophy, along with credentials in gerontology and microcomputer, from Albany State University, a retired vice president for academic affairs at the Bethany Divinity College and Seminary, and founding pastor of the Institutional First Baptist church, has completed his new book “Prayer: A Biblical Examination and Applications”: a prolific discussion on the universality of prayer based on sermons and texts lifted from the Bible. Published by New York City-based Page Publishing, E. G. Sherman Jr.’s thought-provoking narrative is an essential source for people who seek answers to questions regarding the topic of prayer, and hopes to present a focused study about it, as found in the Bible and as viewed in the Judeo-Christian belief. Readers who wish to experience this fascinating work can purchase“Prayer: A Biblical Examination and Applications” at bookstores everywhere, or online at the Apple iTunes store, Amazon, Google Play, Kobo, or Barnes and Noble.